The violin family of musical instruments was developed in Italy in the 16th century. At the time the name of this family of instruments was viole da braccio which was used to distinguish them from the viol family (viole da gamba). The standard modern violin family consists of the violin, viola, cello, and double bass. The playing ranges of the instruments in the violin family overlap each other, but the tone quality and physical size of each distinguishes them from one another. The ranges are as follows: violin: G3 to E7; viola: C3 to A6 (conservative); violoncello: C2 to A5 (conservative); and double-bass: E1 to C5 (slightly expanded from conservative estimate). Both the violin and viola are played under the jaw. The viola, being the larger of the two instruments, has a playing range that reaches a perfect fifth below the violin's. The cello is played sitting down with the instrument between the knees, and its playing range reaches an octave below the viola's. The double bass is played standing or sitting on a stool, with a range that typically reaches a minor sixth, an octave or a ninth below the cello's. While the cello (which developed from the bass violin), the viola and the violin are indisputable members of the ancestral violin or viola da braccio family, the double bass's origins are sometimes called into question. The double bass is occasionally taken to be part of the viol family, due to its sloping shoulders, its tuning, the practice of some basses being made with more than four strings and its sometimes flat back. Others point out that correlation does not imply causation and say that these external similarities are either arbitrary or that they arose from causes other than a relationship to the viol family. They point to the internal construction of the double bass, which includes a sound post and bass bar like other violin family instruments as a more weighty piece of evidence than the external features. Its origins aside, it has historically been used as the lowest member of the violin family. All string instruments share similar form, parts, construction and function, and the viols bear a particularly close resemblance to the violin family. However, instruments in the violin family are set apart from viols by similarities in shape, tuning practice and history. Violin family instruments have four strings each, are tuned in fifths (except the double bass, which is tuned in fourths), are not fretted and have four rounded bouts while always having a sound post and bass bar inside. In contrast, the viol family instruments usually have five to six strings with a fretted fingerboard, are tuned in fourths and thirds, often have sloping shoulders, and do not necessarily have a sound post or bass bar. The instruments of the violin family may be descended in part from the lira da braccio and the medieval Byzantine lira. One of the most popular and standardized groupings in classical chamber music, the string quartet, is composed entirely of instruments from the violin family: two violins, one viola and one cello. This similarity in the manner of sound production allows string quartets to blend their tone colour and timbre more easily than less homogeneous groups. This is particularly notable in comparison to the standard wind quintet, which, although composed entirely of wind instruments, includes four fundamentally different ways of producing musical pitch. The octobass, a larger version of the double bass, is a rarely used member of this family constructed in the 19th century. It is extremely unwieldy to play and thus has not found much acceptance; nevertheless, it can be found in some Romantic-era scores and is called for occasionally in modern works. 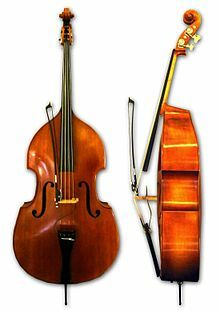 The octobass is played standing and its range typically reaches an octave below the double bass. Violin octet, an experiment in part to create an even more homogeneous blend of instruments related to the violin. Grillet, Laurent (1901). Les ancêtres du violon et du violoncelle. 1. Paris. Harper, Douglas. "Viola". Online Etymology Dictionary. Retrieved September 26, 2006. Hoffman, Miles (1997). The NPR Classical Music Companion. New York: Houghton Mifflin Company. ISBN 0-395-70742-0. Regazzi, Roberto, ed. (1990). The Complete Luthier's Library. A Useful International Critical Bibliography for the Maker and the Connoisseur of Stringed and Plucked Instruments. Foreword by Charles Beare; revision of the English text by Jane Helen Johnson. Bologna: Florenus Company. ISBN 88-85250-01-7. Witten, Laurence C., II (Oct 1982). "The Surviving Instruments of Andrea Amati". Early Music. 10 (4): 487–494. doi:10.1093/earlyj/10.4.487. This page was last edited on 3 March 2019, at 12:09 (UTC).